The Spectradyne nCS1 employs a novel implementation of the resistive pulse sensing method to count and size nanoparticles quickly and with high resolution. Sizing precision of ±3% is typically achieved, with measurement rates up to 10,000 particles/s. Because particles are measured individually in the nCS1, accurate size distributions of samples with a wide range of diameters can be obtained. 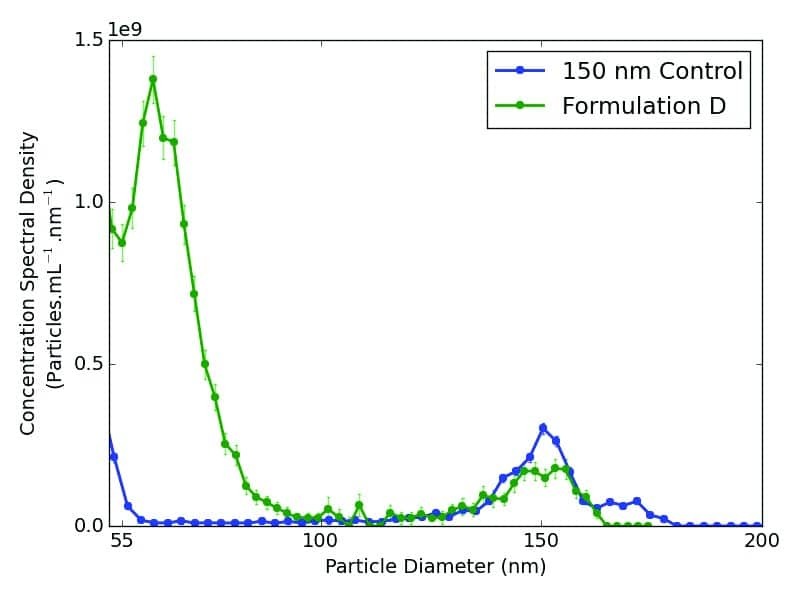 Spectradyne has used these unprecedented capabilities to measure the particle size distribution in commercial samples of nanoparticles (NPs) for targeted drug delivery applications. The concentration and size distribution of drug-carrying particles give critical information about bioavailability of the drug, and the immunogenicity and stability of the formulation. The nCS1 has been used to characterise diverse particle types, including synthetic organic NPs, biocomposite NPs, and inorganic NPs. The size distribution at right shows biocomposite nanoparticles used to deliver high-potency cancer drugs to the site of a tumour. The concentrated sample was combined with 150 nm polystyrene control beads and diluted in PBS. The NIST-traceable polystyrene beads provide an in situ positive control for the measurement, and can be used to further improve the precision of the measurements. The mean diameter of the nanoparticle drug carriers was determined to be 61 nm (CV ~ 25%), with total concentration 3.5 x 1013 particles/mL. 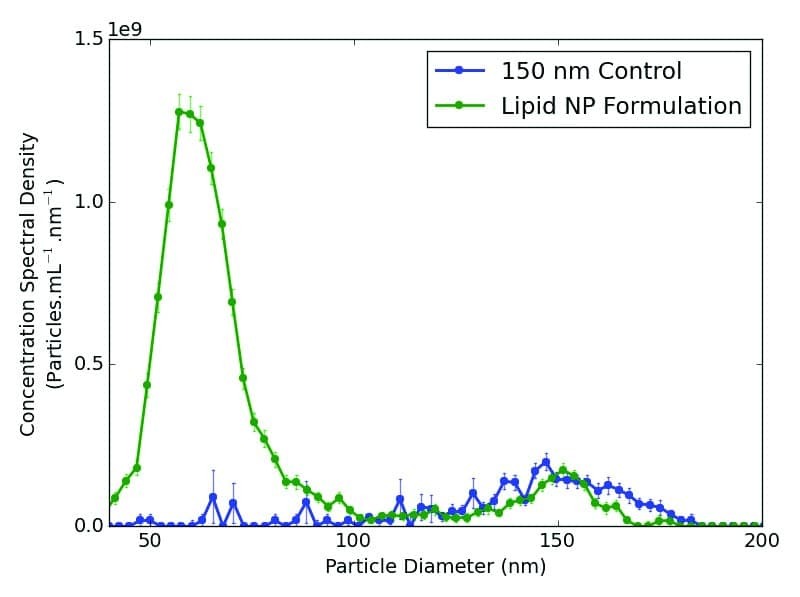 The distribution to the left shows the analysis of a lipid nanoparticle drug formulation. The sample was prepared as described above, with 150 nm polystyrene control nanoparticles added to yield a final concentration of 5 x 109 particles/mL. The mean diameter of the lipid nanoparticles was measured to be 62 nm (CV ~ 19 %), and the concentration of the 62 nm particle population was measured to be 2.6 x 10,sup>10 particles/mL. In each of these examples, the measurements from Spectradyne’s nCS1 informed the customer’s manufacturing process and provided analysis that could not have been obtained using any other method. Spectradyne’s nCS1 provides accurate, high-resolution particle size and concentration distributions for particles of all material types.